After nearly three decades of operating in a portable Quonset hut, the YMCA Nanook House daycare center in Vancouver, British Columbia is moving into a new community building. For parents of special needs children, the Nanook House is extremely important. It provides critical childcare, meals, and family counseling services to children aged three to five. 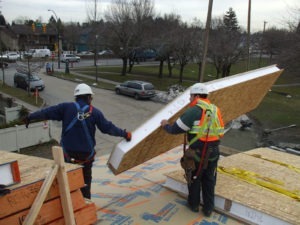 Luckily, Insulspan brought many year’s experience in using SIPs in community building. The goal of a new facility got a boost when the late Bob Ackles, a former B.C. Lions CEO and Vancouver YMCA Board Member, took over fundraising for the Nanook House. Ackles successfully raised over $2 million, with municipal and provincial governments contributing an additional $1.3 million. The new 6,000-square-foot Bob and Kay Ackles Nanook House, designed by Walter Francl Architecture, allows the YMCA to add much-needed child care spaces. It also allows expansion of counseling services, and health and educational support for families. Insulspan® worked with Alfred Horie Construction (AHC) once they were awarded the job of constructing the new facility. AHC has been in the construction business for over 100 years, offering contracting services for both residential and commercial projects. When faced with constructing a unique roof with long overhangs, AHC Partner John Paone came up with a creative idea to simplify the roof construction and save money. He specified the Insulspan Structural Insulated Panel (SIP) system in place of a conventional wood framed roof. “We recommended using structural insulated panels for the roof assembly because it would save us time and money, and it would give us a higher R-value than conventional insulation methods,” said Paone. Paone’s suggestion paid off when Insulspan’s ready-to-assemble SIPs arrived at the construction site and were quickly installed, saving an estimated $20,000-30,000 in labor and materials. In addition to saving money on the construction site, Insulspan SIPs provide excellent thermal performance with minimal air leakage. Paone works on a wide variety of projects, including those with AHC’s residential development business. He sees Insulspan SIPs as a green solution for a range of different applications. With the energy efficiency and resource saving benefits, Paone is on the lookout for new ways to incorporate Insulspan SIPs into his projects.